Myrtle Beach is a relatively young city that did not begin to experience real growth until after World War II. The first appointment of a resident priest in Myrtle Beach came in 1946 with Monsignor Richard C. Madden. He stayed as pastor at St. Andrew until 1973. In 1956, his dream of a school became a reality when two classrooms and an auditorium were opened. By 1958, this had grown to four classrooms. In 1962, a second addition to the school was built which included a small library and administration office. This allowed St. Andrew to house grades one through eight. The one-story fireproof school building was constructed of concrete block with a brick veneer. The Church was a small wooden structure on the corner of 29th Avenue and King’s Highway. The completion of a new church beside the school in 1965 added greatly to the spiritual education of the students. In 1957, the second year of operation, St. Andrew School was staffed by the Sisters of Charity of Our Lady of Mercy and assisted by lay teachers. The Sisters of Charity left Myrtle Beach in 1973 and were replaced by the Little Franciscan Sisters of Mary, whose Provincial House is located in Worcester, Massachusetts. Principal Sister Irene Rioux O.S.F. and three sisters along with seven lay teachers educated the students of the school from 1973 to 1987. A very active Parent Teacher Organization (PTO) has enabled St. Andrew to expand its physical plant without incurring any long-term debt. In 1989, a new wing was added to the front of the existing school. It included a classroom, a science lab, a computer lab and administrative offices. This addition allowed the school to add a kindergarten, expand the library, and greatly enhance its curriculum. Upon completion of this project, money was available to pay the construction costs within one year. This was due largely to the PTO annual fund-raiser, “Taste of the Town”. This yearly event has become a very prominent part of the fall social scene in Myrtle Beach. It has not only provided an excellent source of income, but also adds to the fine reputation of St. Andrew. 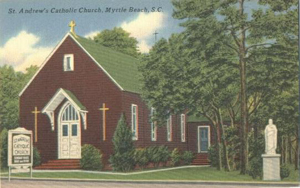 As the Myrtle Beach population grew, so did the parishes of St. James, St. Michael, and Our Lady Star of the Sea. Today these parishes send many students to St. Andrew. Their financial support is a very important revenue source in the school’s fiscal operation. In November 2005, St. Andrew was named a National Blue Ribbon School by the US Department of Education. Nomination for this prestigious designation was predicated upon our students’ excellent scores on the Iowa Test of Basic Skills, a national standardized test which was given each fall. The evaluation committee looked for evidence of exceptional instruction techniques, innovative programs, parental and community involvement, and a balanced extracurricular program. St. Andrew received high marks in all areas. Our new gymnasium opened in November 2006. It is used for physical education, organized sports, and many school and parish gatherings. During the 2010-2011 school year, St. Andrew along with the entire Diocese of Charleston became accredited by the Southern Association of Colleges and Schools (SACS) through AdvancED. Summer 2011 brought on an extensive renovation and addition to our school building. An art room, music room, new Kindergarten, new Library/Media Center, Health Room, and new offices have been added. These improvements are allowing our programs to be enriched and expanded. Today St. Andrew provides education for students in Kindergarten through 8th grade. An extended care program is available for students each afternoon until 5:30 PM. The additions of Algebra in grade 8, Spanish, Art, Music, Computers, Accelerated Reader Program, and Measures of Academic Progress (MAP) testing have enriched an already strong academic curriculum. The offerings of multiple extracurricular activites including various sports and clubs add to the well-balanced development of our students.